The 864 TRV Clean Face | TRV | FPX Fireplace is the answer for homeowners searching for a handsome fire that delivers supplemental heat. 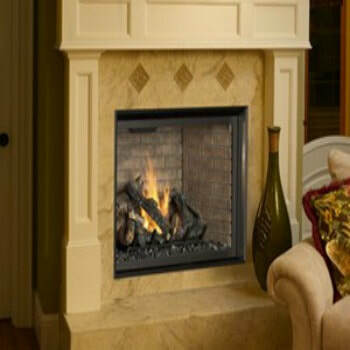 This gas fireplace is perfect for zone heating or small to medium sized homes. Easily adjust the heat output, to enjoy the ambiance of fire year around! Enjoy the fire view of gleaming embers and log set from anywhere in the room, with 864 square inches of clean faced glass. You will love the premium look of this modern fireplace, with no bulky grills, louvers or visible faces. The unit includes the ANSI approved safety barrier. This barrier boosts the safety of unit for your home without interrupting the fire view. Easily regulate the heat output while maintaining the embers and fire, with the help of the Comfort Control system. This fireplace will provide you with a gorgeous fire and the ability to regulate the heat output, which makes it perfect for Montana seasons. *All measurements and colors are approximate, please contact Bare's for details. Specifications may change without notice. Please note Bare's Stove and Spa strives to update manuals and information as they become available. These are for reference only; the latest documentation by the manufacturer takes precedence. Please visit Bare's for color options, dimensions and additional information. If the project is outside of Southwest Montana please visit the FPX site for dealers that may be near your area. Bare's Stove and Spa may only sell these products bought and picked up from our store locations. Please understand we are unable to ship, sell, deliver, install, service or provide warranty for items outside of our area.